Smart Coupons provide a powerful, “all-in-one” solution for gift certificates, store credits, discount coupons, and vouchers. The plugin allows customers to buy credits for themselves or gift them to others. It automatically issues coupons on product purchase, provides “Apply Coupon with One Click” technology and more. After activating Smart Coupons, you will be redirected to Welcome Page of Smart Coupons that describes Features and FAQs. Go to: WooCommerce > Settings > General > Enable coupons. Make sure coupons are activated on your store. Note: All the screenshots on this page is from version 3.4.0. The appearance of fields might differ if you’re using the older version. Number of coupons to show: How many coupons (at max) should be shown on cart/checkout page? Number of characters in auto-generated coupon code: This option can be used to set the length of the coupon code that are generated automatically excluding prefix and/or suffix. The default length of the auto generated coupon code is 13. It is recommended to keep this number between 10 to 15 to avoid coupon code duplication. Subject for Coupon emails: Subject for coupon details emails to customers. Store Credit / Gift Certificate: Use this option to rename Store Credit / Gift Certificate on your site. For example, if you want to call Store Credit / Gift Certificate as Gift Voucher on your store then set both the Singular and the Plural name for ‘Gift Voucher’. In this case, the Singular name will be ‘Gift Voucher’ and Plural name will be ‘Gift Vouchers’. Add new coupon. 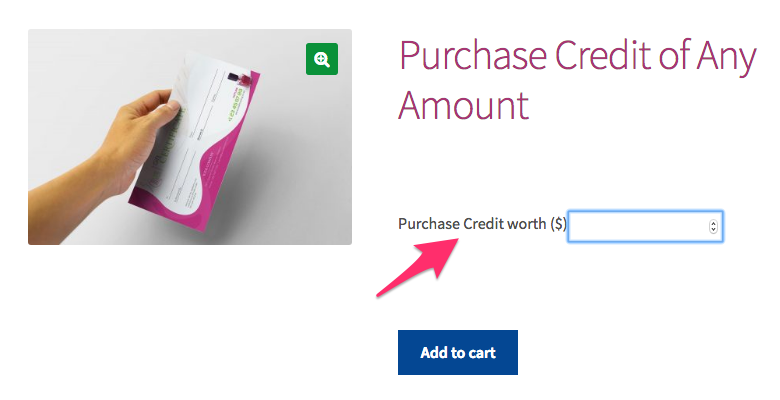 If you want to create a credit-based coupon, Store Credit or Gift Certificate, use Store Credit/Gift Certificate as the type. If you need help with adding coupons in WooCommerce and setting up restrictions by usage, email address or other limits, see Coupon Management. Any coupon can be used to as a template to auto-generate new and unique coupons but with same attributes as the original. This feature also increases security, as people then can’t share coupons since auto-generated coupons are restricted to a customer’s email address. Note: This field is only available for discount types other than Store Credit/Gift Certificate because the auto-generation feature is the default behavior for Store Credit/Gift Certificate. Add a new coupon (or edit existing coupon). Go to: Auto Generation of Coupon and enable. Set up a prefix and/or suffix if you wish. To associate this coupon with a product, see: Linking a Coupon with a Product. You can define the expiry date of a coupon in days, weeks, months and years. The feature automatically sets expiry date of a generated coupon according to the date of issue. 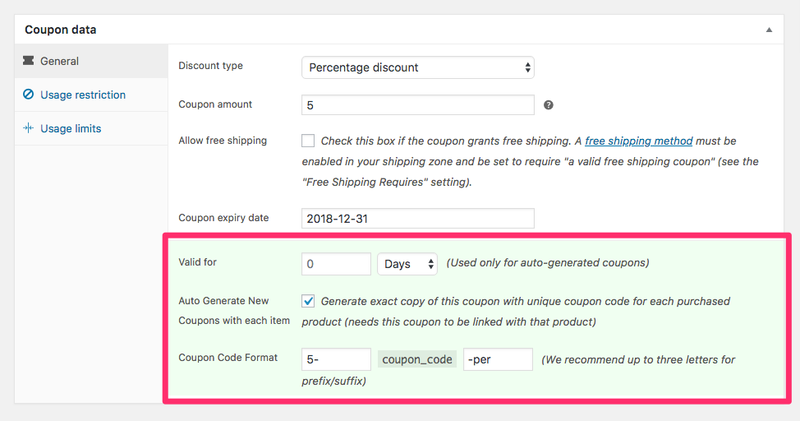 To use this feature on any coupon, enable Auto Generation. This can be used for both individual and bulk generated coupons. Prefix/suffix will only be added when Auto Generation of Coupon is enabled for a coupon. Add a new coupon or edit existing coupon. Enable Auto Generation of Coupon. Enter text to be used as Prefix/Suffix in respective fields. 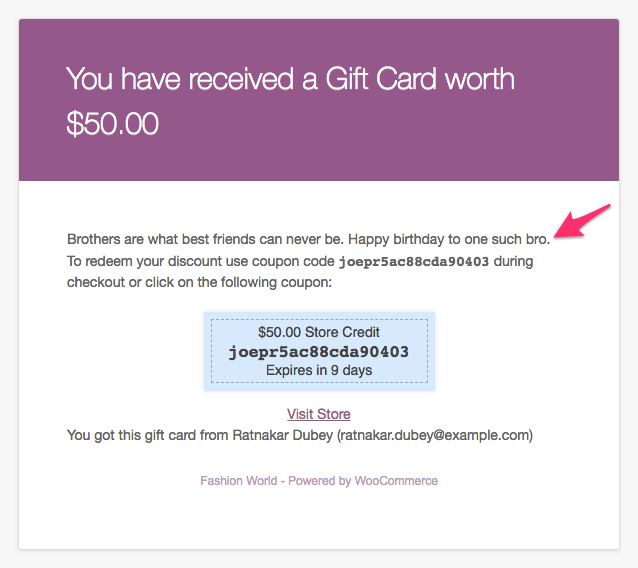 To duplicate a coupon, go to WooCommerce > Coupons. Find the coupon you wish to duplicate. Filter coupon list. Smart Coupons provides additional feature to filter coupon created for specific users by entering the user’s e-mail ID & “Email: ” as a prefix to user’s e-mail. Hover over the coupon and select Duplicate. Smart Coupons allow you to generate coupons in bulk with all necessary options required for a coupon. 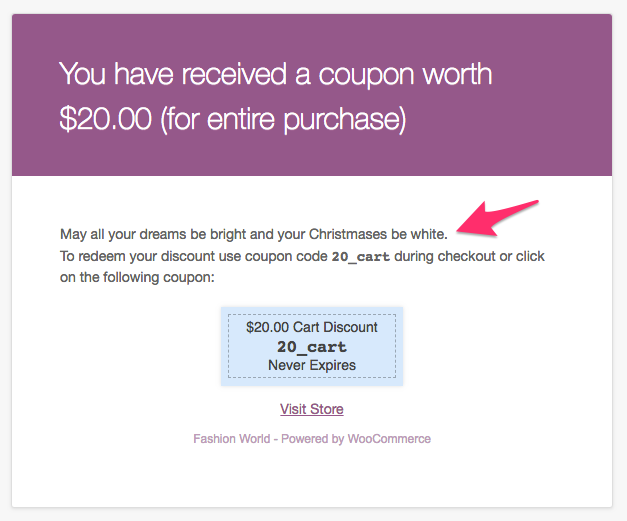 Go to: WooCommerce > Coupon. Select “Bulk Generate” next to the Coupons tab. Smart Coupons gives you the ability to bulk import coupons using a structured CSV file. 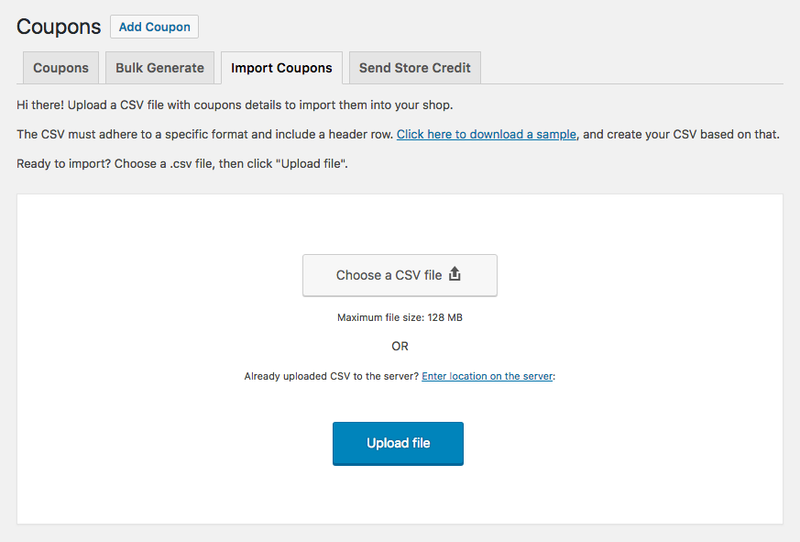 A sample.csv file is included in the Smart Coupons plugin folder within your WordPress install. You can use this as a starting point to create an import file. Important: If you’re importing coupons on site having different language, make sure the discount_type column of your CSV file have the translated value of corresponding discount type. Select Import Coupons tab next to Bulk Generate. Upload file using the button. You can also send the generated coupon code to the respective customer at the time of import. This works with the Email Restrictions option. Any email addresses you entered will receive coupons once coupons are imported. Click Import and wait for a message about importing. 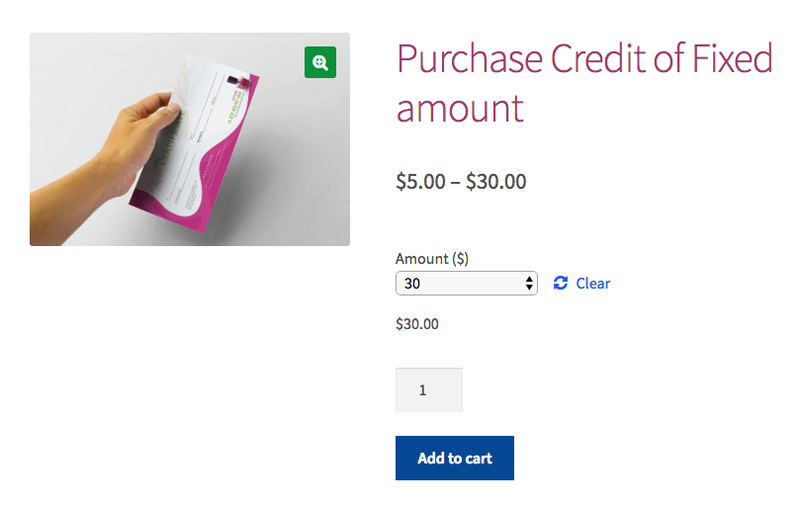 Go to: WooCommerce > Coupon and then the Send Store Credit tab. Enter E-mail address, Credit amount and Message (optional). Click Send to send Store Credit immediately. You’ll receive a success message after sending the Store Credit. Linking a coupon with a product allows you to give a coupon to customers who purchase a specific product. After the purchase is complete, the customer receives the coupon in his account, ready to be applied to the next order. Select Coupons under the General tab. Enter the name of a coupon you want to give a customer with this product. Select the coupon from the suggestions displayed. Add as many coupons as you like. Set up all other details for the product if not done already. Select Update or Publish to save changes. 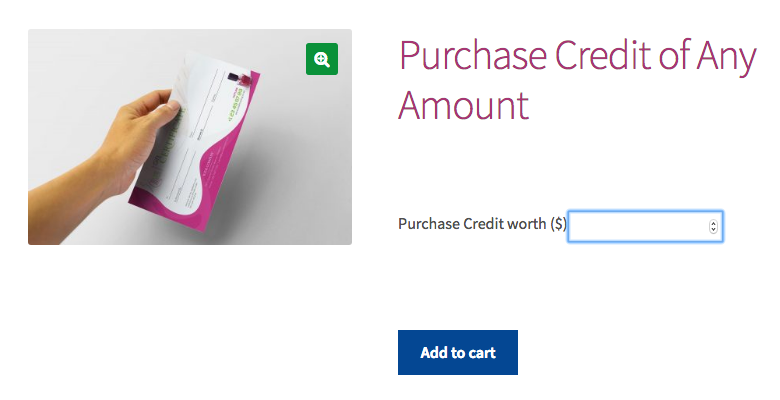 The Store Credit functionality of Smart Coupons is different from how normal coupon codes work. Store Credit is treated as real credit/money – very much like a pre-paid credit card. As such, Store Credit codes cannot be excluded from the shipping costs or any other costs. So while the standard coupons can be restricted, store credit and gift certificates can not – the idea behind this being that someone paid for the store credit/gift certificate in advance. Give it a title, i.e., GenerateCalledStoreCredit. Important: Coupon code should not have any spaces between the name. Select Store Credit/Gift Certificate as Discount type. Important: Leave coupon amount blank. Enable Coupon Value Same as Product’s Price? Add or edit an existing Simple Product. Name the product, i.e., Store Credit/Gift Certificate. Important: Leave Regular Price & Sale Price fields blank. Important: If you do not want to charge shipping for this product, mark product as Virtual. Search for and select coupon created in above step, i.e., GenerateCalledStoreCredit. Now your customer can purchase a Store Credit/Gift Certificate in any amount. Note: Feature is compatible with Name Your Price. Important: If you have any coupon in your store, which can be used to buy this store credit/gift certificate, make sure to set ‘Usage limit per user’ under ‘Usage Limits’ to 1. Otherwise, your customer will get real credit at a discounted rate for multiple times, It may result in the overall loss for your store. A customer visits the product page, which allows them to purchase credit in any amount. They enter the amount of credit they want to purchase. The quantity can be adjusted, if they want to purchase more than one credit, for example, credit for $600 in the form of gifts of $300 each for 2 people. Customers would enter 300 in the provided box and increase the quantity to 2. They go through normal purchase process: Add to cart > Cart > Checkout > Payment. After payment is completed, a credit is generated and forwarded via email to recipient(s). The sender is informed by an acknowledgment email. You can sell store credit/gift certificates of the fixed amount by creating product variations. Give it a title, i.e., call_for_credit. Important: Coupon code should not have any spaces between the name. Select Discount type as Store Credit/Gift Certificate. Important: Leave Coupon amount blank. Add a Variable Product or edit an existing Variable Product. Associate the above-created coupon with this product. Add attributes to a variable product as explained here. Create product variations, where each variation has a unique and fixed price. Important: If you do not want to charge shipping for this product, mark product variations as Virtual. When customer will purchase any product variation, a coupon with the same price as of the variation will be created & will be emailed to respective customers. If you’re using version 3.8.0 or more of Smart Coupons, you can customize the look of coupons that are displayed on your store. You can choose from pre-defined designs, choose background color, text & border color. 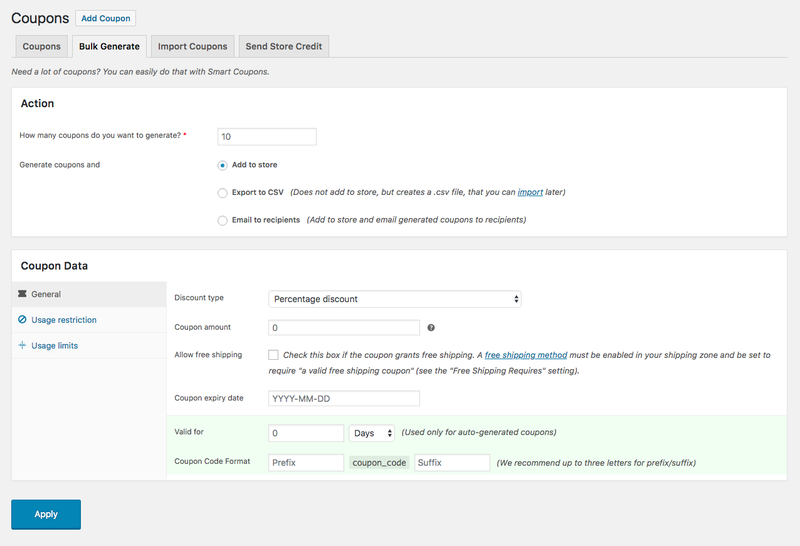 Go to WooCommerce > Settings > Smart Coupons. Set text & border color. From version 3.7.0 you can set a coupon to be used by new users only. Create a new coupon from Coupons > Add new. In the “General” tab, look for field “For new user only?”, enable this checkbox. Set other fields of the coupon as per your requirement. 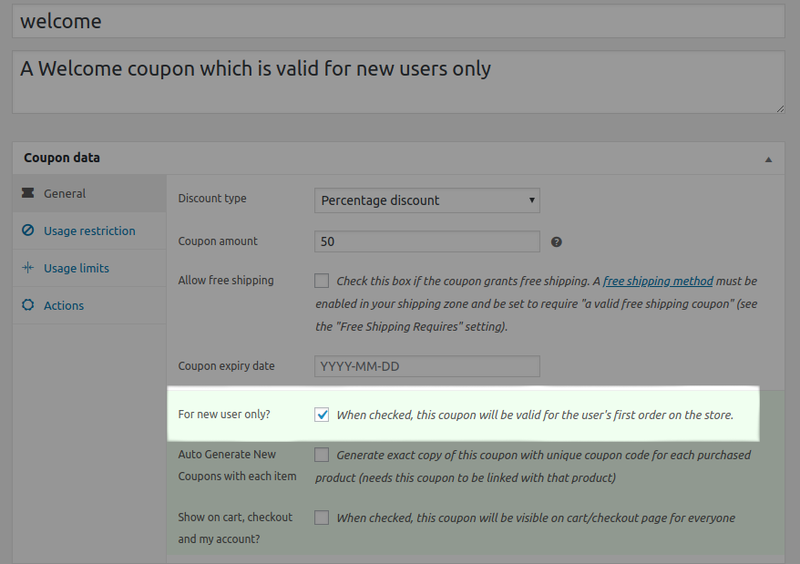 From version 3.5.0 you can set additional action in coupon which will be executed after coupon is applied to cart. Currently there’s only one action available which is adding product to cart. Create a new coupon or edit an existing one. Search & choose products you want to add to cart on applying this coupon. Optionally set discount which you want to be applied on these product before adding to cart. Set other fields of the coupon as per your need. From version 3.7.0 this feature will allow you to set a label for ‘Store Credit / Gift Certificate’ throughout the store. It means the label set by you will appear wherever the store credit is referenced. Look for “Store Credit / Gift Certificate” under “Labels”. Set singular & plural name in respective field. From version 3.7.0 you can restrict the number of characters in the auto generated coupon code. It is recommended to keep the number of characters as high to prevent duplication of auto-generated coupon code. Go to WooCommerce > Setting > Smart Coupons. Look for “Number of characters in auto-generated coupon code”. 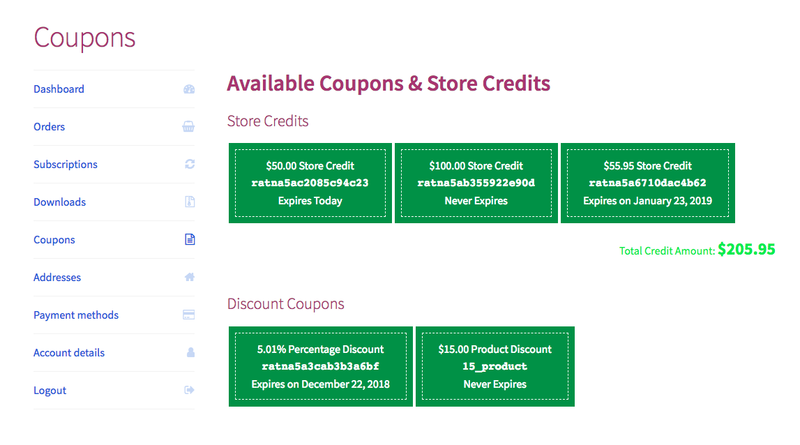 Smart Coupons shortcodes have many features from ‘showing a coupon’ to ‘automatically creating and/or showing a coupon for the current user’. Smart Coupons shortcode will do nothing if it is embedded on a page or (custom) post and a guest user is accessing it. Shortcode will only work for registered and logged in users. In order to add a coupon to a page, go to a post, and in the visual editor, select the coupon icon. In the pop-up, type the coupon code, select one from the search result. Then select Insert Shortcode. In the editor, you’ll now see [smart_coupons] with a few attributes added. Within the shortcode, several other attributes can be added, most of them correspond with the settings you would normally find when creating a coupon. All of them follow the following order: attribute="value". For example, coupon_amount="20". 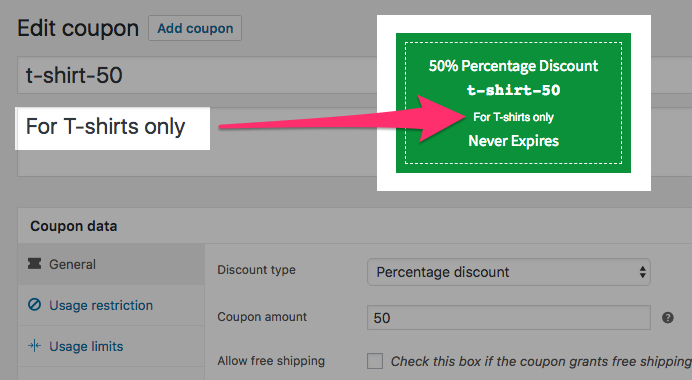 These extra attributes are handy if you do not want to create the coupon beforehand. coupon_style. The styling of the coupon. coupon_amount. The amount of the coupon. 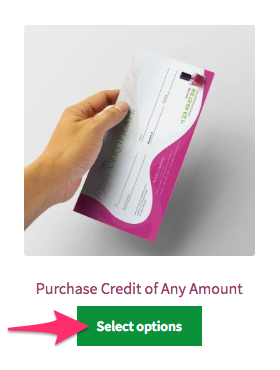 Here, you want your registered customer to see a new unique code for coupon/credit, which will be used by this customer only. For credit: You can enter following code in the editor of page or post: [smart_coupons coupon_amount="12" coupon_style="dashed green medium"]. This will create a new store credit having amount 12 and will display the code with style. Important: Above code will keep creating a new store credit on each refresh of that page or post in which it is included. For coupon: First, create a coupon and make sure that Auto Generate is enabled. Then, go to the page or post and add the coupon with the shortcode. It should look like this: [smart_coupons coupon_code="50_percent_cart" coupon_style="dashed red medium"]. Here, you want all your registered user to see same coupon code and it should not be valid for a guest user or visitor. By default, limiting coupons to registered users only is not an option, but it is possible with Smart Coupons. By adding a shortcode, email restrictions will be added to the coupon automatically, and they will only be available for logged-in users. For credit: Not applicable. Credit can only be used for unique users. For coupon: First, create a coupon and make sure Auto Generate is disabled. Then, go to the page or post and add the coupon with the shortcode. Since PayPal doesn’t allow discount on shipping & taxes, it’s not possible to use store credit on such orders in which the store credit amount is more than items total but less than the order total (items total + shipping + taxes) & the order is being paid by PayPal. 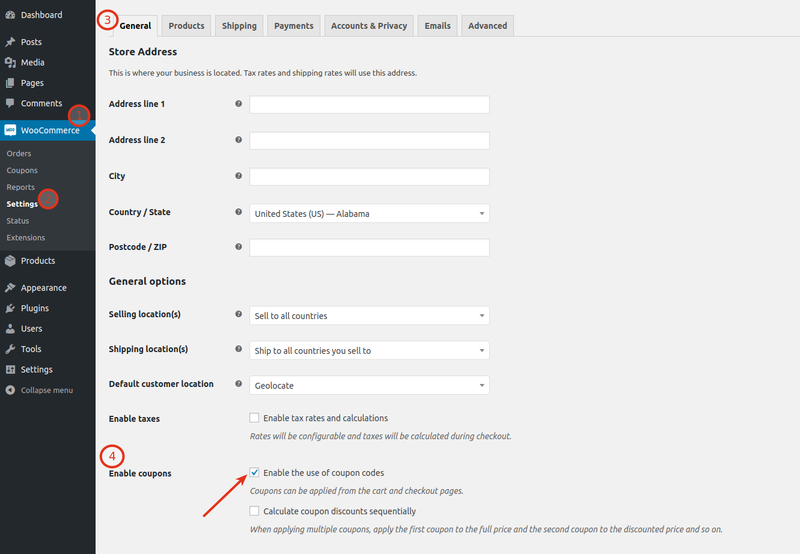 For this feature to work correctly, you’ll need to enable “Apply before tax” under WooCommerce > Settings > Smart Coupons. 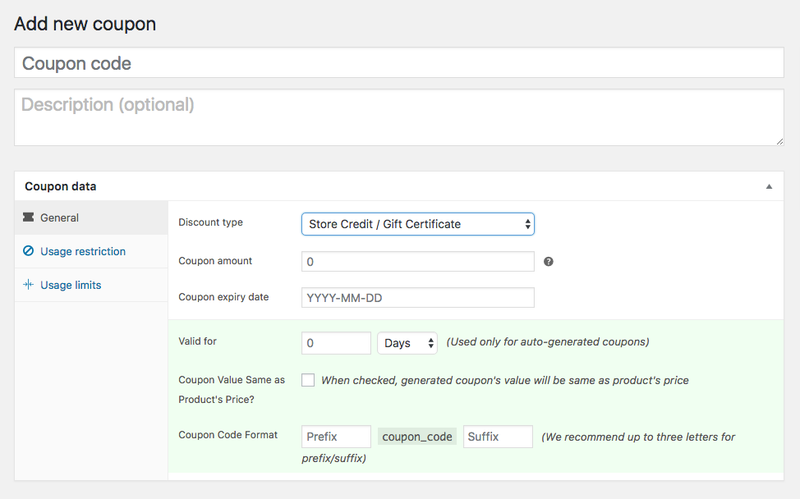 Smart Coupons v2.1+ comes with a new feature, allowing the store admin and customer to see received coupon’s details. It shows all coupons/credits that you’ve received from others. By default, it shows basic details. To see more details like who is sender and receiver, and what is the message, you can click on the coupon. As store manager, you can see all the coupons generated in an order, from order admin page. They can also see sender & receiver of that coupon. Generated coupons sometimes fail to be delivered, and the buyer will ask for the coupon details. 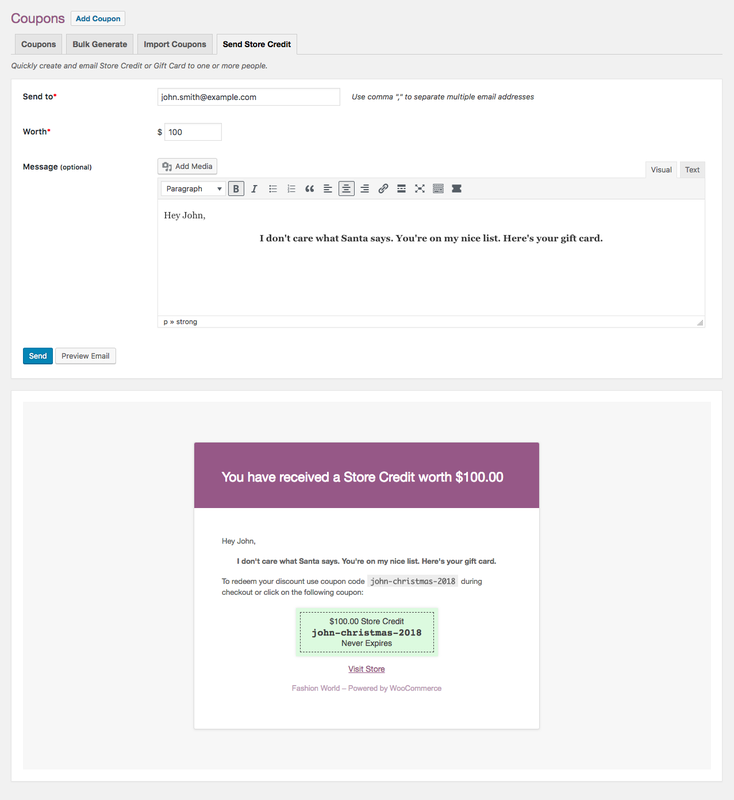 Features available in WooCommerce core can resend some emails to customers, such as the Customer Invoice. Coupons generated after the order are included in the Customer Invoice, so you can use this feature to resend coupon details. Click the round button with the arrow (marked in the screenshot). A buyer can send a store credit as a gift card to a friend. 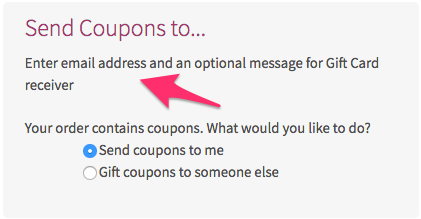 If they are asking to send coupon’s details to a friend directly, this is not possible. You can send a Customer Invoice to the buyer and ask them to copy and send the coupon details to his/her friend. All emails sent from Smart Coupons, including the coupon code, are sent via an existing template that is located in the 'templates' directory of Smart Coupons. If you want to change or modify the content of an email or if you want to the change layout, there are two ways to do it. Open file '/woocommerce-smart-coupons/templates/email.php'. Modify its content and style, as needed. Note: This method is not recommended, as you’ll lose changes after updating Smart Coupons to a newer version. Use your own email template in place of the default one provided by Smart Coupons. Create a template file and keep the file name as: email.php. Other file names will not work. Open your themes folder and create a new folder. Keep the folder’s name as: woocommerce-smart-coupons. Place file email.php inside woocommerce-smart-coupons. The file path of your email template should be: /wp-content/themes/your-child-theme-folder/woocommerce-smart-coupons/email.php. Smart Coupons will use your template file (if found) for all emails sent from Smart Coupons. Install & activate a free WordPress plugin: Loco Translate. You can also place these PO & MO file inside languages directory of the plugin, but it is not recommended, as you’ll lose it when you’ll update the plugin. Now Smart Coupons should display your texts. You can send a store credit to yourself or gift a store credit to someone else. 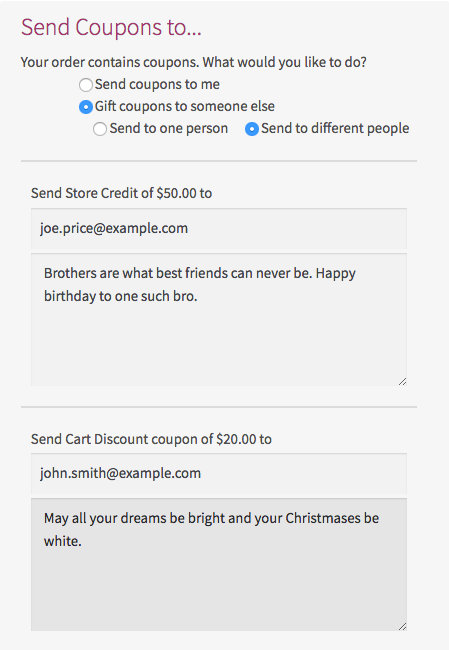 If you want to send more than one gift card, you have separate message fields for each gift card. All generated coupon details are stored in order meta. It shows all the coupons/credits that you have earned while shopping on that website. For example, while purchasing product A, you got a coupon with it. So that coupon will come under ‘Available Coupons & Store Credits‘ section. If you’re using version 3.4.0 or higher, refer this. From version 3.0, this is hidden by default. To enable it again, you need to change a setting. If that row is present in the table, then click on edit and enter option_value as yes and submit the values. Coupon description is hidden by default. To show it on the coupon, you need to change a setting. From version 3.0.6, you can disable all the e-mails that are getting send from Smart Coupons. To disable it, you need to change a setting. If that row is present in the table, then click on edit and enter option_value as no and submit the values. From version 3.2.1, by default, only 5 coupons will be visible on Cart and Checkout page. To change the number of the coupons, you need to change a setting. If that row is present in the table, then click on edit and enter option_value as <number of coupon you want to show> and submit the values. <number of coupon you want to show> = number of coupons you want to show on cart and checkout page. 1. When I try to add a coupon, I get an Invalid post type error? Check whether use of Coupon is enabled in your store. If it’s not enabled, enable it. 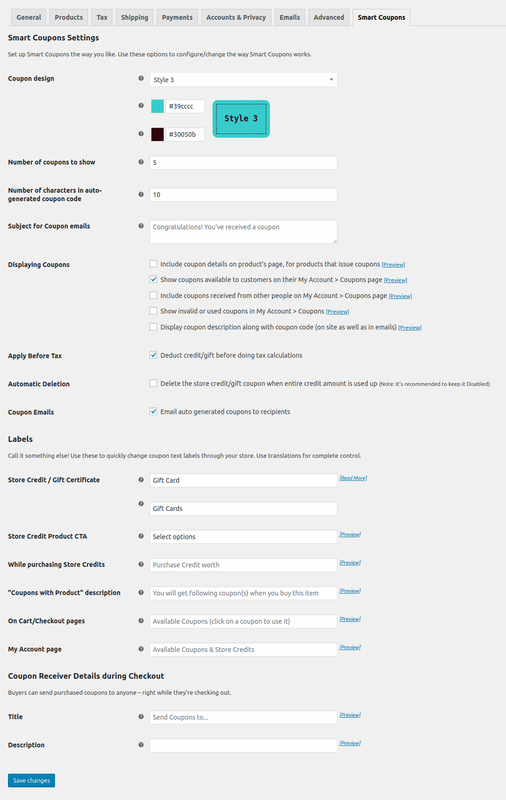 You can find the setting at WooCommerce > Settings > General > Enable coupons. 2. Can coupon code have any spaces in the name? No. Coupon code should not have any spaces in the name, e.g., Coupon code should be like “gift-certificate” & not “gift certificate”. 3. What’s the URL to my coupon, so it’s automatically inserted when visiting? Replace www.mysite.com with your own URL then replace discount5 with the generated coupon code. 4. My Store Credit/Gift Certificate is not working (not generating new coupon code). Ensure your Store Credit/Gift Certificate coupon code doesn’t have space in it, e.g., Coupon code should be like “gift-certificate” & not “gift certificate”. 5. I have problems with coupons after import. If dates are entered in your import file, ensure they are in the proper format. Expiry date format should match the format of WooCommerce, which is: YYYY-MM-DD. You can find this format used with any WooCommerce coupon. If you are entering a post date, it should match the date format of the post date, which is: YYYY-MM-DD HH:MM:SS. You can find this format in the posts table of your WordPress database. 6. Smart Coupons is not sending emails. Smart Coupons sends an email only after the order is marked Completed. Ensure all settings of coupons, products are in place. Check if the order complete email is sending, then only emails from Smart Coupons will send. Also, check by switching your theme. 7. Does Smart Coupons allow printing of a coupon as Gift Card? No, it doesn’t provide any feature which enables you to take a printout of a generated coupon, but if you can take a printout from your email, you can use it as an alternative. We also had a store owner (360064) who set up a simple virtual product with no price, allowing the buyer to choose the amount to give as a gift. The giver gets the code via Smart Coupons, then pastes the code into a downloadable PDF certificate from the store owner and sends it to his/her recipient. 8. Can I limit the number of characters in the generated coupon code? Yes, from Smart Coupons v3.7.0+ you can. Go to WooCommerce > Settings > Smart Coupons. There you will find a setting named ‘Number of characters in auto-generated coupon code’. Modify it as per your needs. 9. Is it possible to remove the Store Credit/Gift Certificate product from a shop page and show it on another page? 10. Is it possible to have a coupon for each variation of the variable product? No, currently, you cannot set a coupon for each variation. 11. Can Store Credit be used as Points system to refer/reward a friend? No, Smart Coupons cannot be used as Points system. Check WooCommerce Points and Rewards. 12. Which should I use for Account Credit/Gift Certificates? Smart Coupons or PDF Product Vouchers? Smart Coupons works like account credit and is linked to a specific account from the time you purchase. It works more like a gift card. If you purchase three x $10 credits to your store and link them all to your account email address, you receive 3 credits each of $10. You can gift these to others, but you need their email address, as they are linked to specific accounts. PDF Product Vouchers work more like a traditional paper gift certificate (in fact you make regular paper gift certificates with it), in that it gives you a coupon code that is redeemable for a specific amount of credit to your (physical) store. Your customers can purchase these for a friend, or themselves. If you want something closer to a gift card, where the funds are linked to your online store account automatically and managed for you there, go with Smart Coupons. If you want something more like a gift certificate, where you can print a few out for your buddies, but they will have to turn in the certificate at the (physical) store, you’re probably going to want PDF Product Vouchers. 14. I’m using WPML & WPML for multi-currency, but Smart Coupons only changes currency symbol and the price value remains the same. Currently, Smart Coupon is not compatible with a multi-currency plugin or with WPML. 15. Is Smart Coupons compatible with WooCommerce Subscriptions? 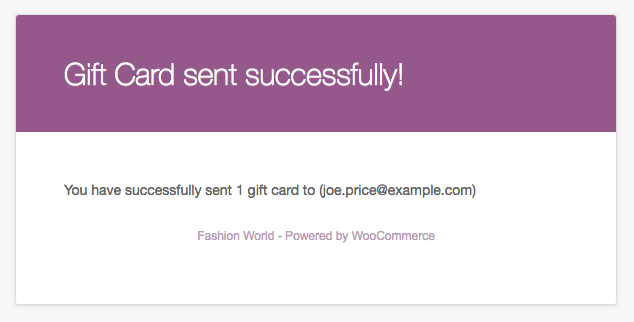 Yes, it works with WooCommerce Subscriptions (separate purchase). Give away a discount or credit on signing up a subscription, give away recurring discount or credits, apply credit during sign up, automatic payment for renewals from credit (Note: When using PayPal Standard Gateway, store credit can be applied only during sign up. Automatic payment for renewals by credit will not work for PayPal Standard Gateway). Customers can apply store credit on a subscription. If the same store credit has sufficient balance, it’ll keep applying it to renewals till the remainder in store credit is higher than renewal price. Customers will be able to apply store credit only during signup. They will not get an option to apply store credit in renewals. But if the store credit will not have sufficient balance to pay for the renewals, then the order will go into pending mode. Now when the customer will go to pay for this renewal order, they’ll get an option to apply store credit again. To activate the subscription again, the customer will have to pay for the renewals. When the customer is paying for the renewals from his/her account, then in that process he/she can use the same store credit which didn’t have the sufficient balance, again & pay for the remaining amount. No, this is possible only in those cases where subscription amount is more than store credit’s balance. If store credit’s balance is more than subscription’s total then your bank account or credit card will not be charged. Already purchased and need some assistance? Get in touch with the developer. 1. How to show/hide linked coupons on the product page? 2. How to show/hide coupon description on the coupons? 3. How to disable e-mails getting sent from Smart Coupons? 4. How to change the number of coupons visible on cart and checkout page? 13. Can a customer send a gift certificate to themselves to pass on to someone else? 16. Which features of Smart Coupons work with Subscriptions? 17. How does automatic payment by store credit work with Subscriptions? 18. Is it possible to partially pay for a subscription with store credit and the remainder by another method?